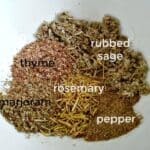 This home made poultry seasoning will save you a trip to the store, and let you control the flavor! Make a batch and keep it handy. Blend all the ingredients in a mortar and pestle and grind together.